To get some kinda server balance. So one team isn't constantly missing players, players leaving. Loosing over and over and over again. Only hope trying to find a new server, just to find that you get the same server again, because of few players. It aint fun winning, it aint fun loosing so fast. Even the winning teams, get to play hero for like 1 minute. Got a lot rounds here tonight, and the rounds was insanely short! If this doesn't get fixed, I'm off the very short pew pew game! It's fixed....EORMM fixed it. DICE'S numbers say it's not a problem . It's DICE, they don't care about balance. They don't even do server maintenance. Playing on 79ms ping (VIRGINIA server) and im being 3 barred the whole game? like how? that doesn't make sense since there is allot of evidence showing otherwise. About the only thing that can be mutually agreed is that less hosting resources were consumed ....GO us for being so Green ! 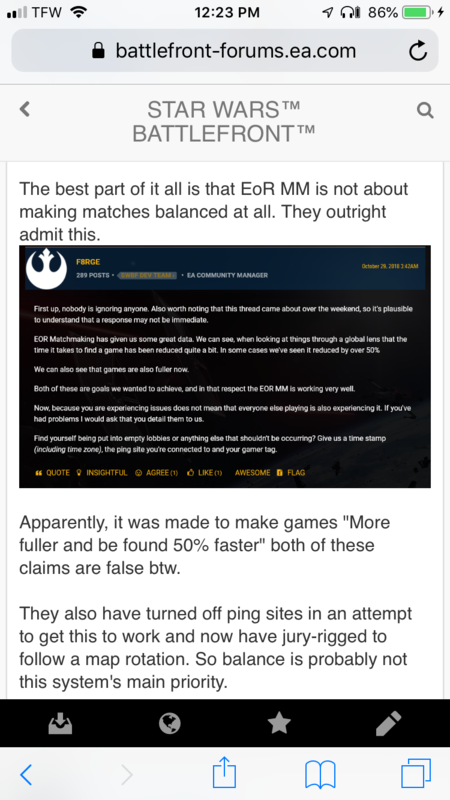 Theoretically this shouldn't be locked, and we shouldn't be redirected to the rip EOR matchmaking thread as this is more about balancing, and EOR isn't meant to fix balancing it's only meant to fill up lobbies faster after all the players quit cause of bad balancing. So this really is a separate issue.